On Friday 26th April, staff members of the Community Trust will be taking part in the 5th annual ‘Big Sleepout’ in Blackpool town centre. 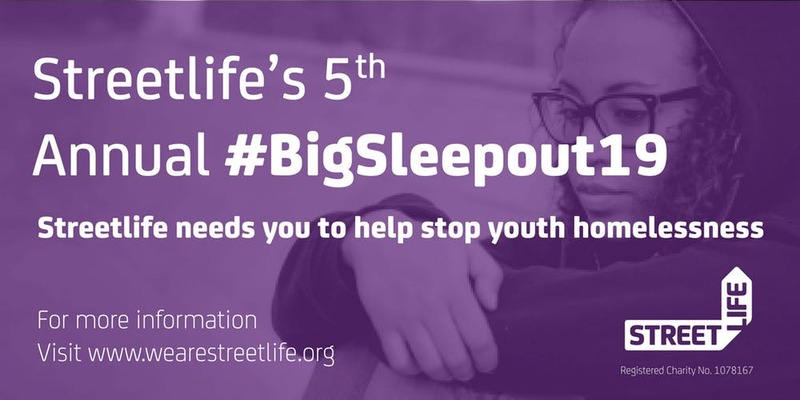 The aim is to raise money for the charity Streetlife who work with vulnerable young people in the Blackpool area, with the donations going towards keeping the Night Shelter open, a safe accommodation for homeless young people to access. The Night Shelter is open 365 days a year and has been running since 1992. As well as providing emergency accommodation Streetlife offer advice and support for young people across a number of issues, such as mental health problems and substance misuse. There are also drop in sessions available four times a week where young people have the opportunity to socialise, have something to eat and gain access to the internet to search for accommodation or apply for a job. Last year, the sleepout raised an amazing £41,000, so this year we are getting involved to help try and raise even more! Five of our staff members will be sleeping on the street in St John’s Square to raise money towards this fantastic cause and have raised 80% of their target already! If you can help out by donating to support the great work that Streetlife do, please visit our Just Giving page. Any contribution will be greatly received. This entry was posted in Latest News on April 12, 2019 by Lauren Cholmondeley.